First of all, the folks in the restaurant were very accommodating. We arrived at noon only to discover that they wouldn't be opening until 12:30. In recognition of the heat of the day, we were invited in, the air conditioning was turned on, and we were given a carafe of water while the floor was mopped and the tables set. As far as the meal goes, the service was attentive without being intrusive. The food arrived piping hot and as ordered. The stuff that was meant to be spicy-hot was not too spicy, as we requested. But it was still plenty spicy. The tastes were interesting and varied enough to thoroughly please our unschooled palates. And the price was reasonable...except that we missed noting that bottles of Kingfisher Beer came to €5 per bottle. We had five between us, adding 30% to the cost of the meal for three people. 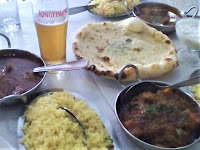 Without the pricey beer, our meal averaged €25 per person with starters, mains, sides, and a dessert or two. 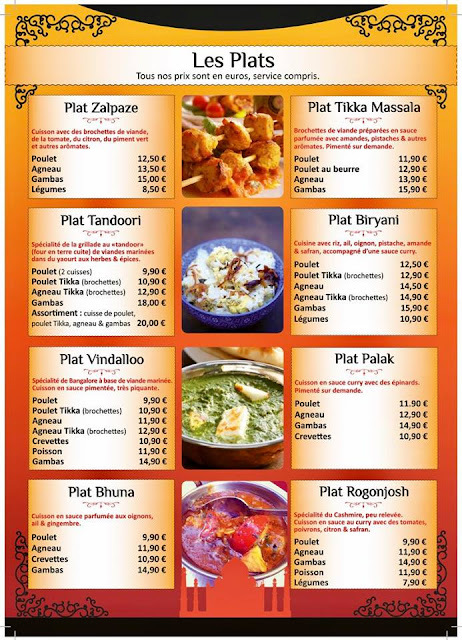 An online friend said that there were no decent Indian restaurants in France. They all serve beef, he said. They therefore cannot be authentic. Le Taj Mahal doesn't serve beef. Maybe it is authentic. I can't say. You decide. Find Le Taj Mahal's website HERE. It's not a very friendly site and doesn't show one-tenth of the menu. And the menu below only shows their takeout main dishes. You'd get a better feel for the place on their Facebook page. You can read more of my restaurant reviews HERE. We are Brits who have eaten at virtually all the Indian restaurants in the region and they are like the curate's egg. They have a tendency to "dumb down" the spice and heat to accommodate the delicate French palate . If you have been brought up on robust dishes in the UK where most " Indian" restaurants are owned and staffed by Bangaladeshi , they are insipid. For authentic Indian food and especially Indian street food, can I propose a private supper for up to eight at Mailhac cooked for you by http://www.chillisandspice.com/ I have no commercial connection with this company - just love their authentic Indian food. You don't say whether or not you have eaten at Le Taj Mahal though. Adele has read this review and said that Le Taj Mahal is on her list. I'll be interested in hearing what she has to say. As for me, I try not to generalize.